How Do You Help Leaders See the Change That Is Needed? For today’s post, I am wanting the readers’ responses to help fill in the gaps on this topic. It is one that I struggle with and thought a discussion here might be good. What do you do when change is needed but no one will change? I know. The question seems pretty simple, right? Leave the situation because it won’t get better. People can be so stubborn so why fight it. An organization is struggling mightily. Going the way of GM in the early 2000’s. Everyone in the organization sees the need for change and agrees that change is needed. Not small change. Big change is needed. A different way of seeing and executing the business. This one idea is a great one and on that is much needed but it won’t change the way the organization does business. The concerning part was doing an interim report out the leaders who sanctioned the work were good with this. They couldn’t even see all the waste that was left on the table to eliminate. During the final report out some of the other leaders pushed on some bigger changes, but most of that was due to the lean change agents prepping the leaders to ask the harder questions. So. What do you do when everyone agrees dramatic change is needed but no one can see or envision what that might even look like? I understand that not everyone can see it, but usually they are open to suggestions. I see this as a leadership issue. Leaders need to be able to see the change and help build the burning platform. Some can see it. But the extra push isn’t there. I have been working with one group on how to make there work more visual. Show production goals versus actual production. Make safety standards clear. Highlight any problems to help them improve. The supervisor of the area was on person leave when I was helping the area. Upon her return, she liked what we had done. In fact, she liked the idea so much that she made a visual board for another area where she is the supervisor. What was the problem she was trying to solve? Employees were always asking what their goal for the day was. Employees would leave their work station and abandon their work to find the supervisor just to ask what the goal was. The supervisor posted this board in the work area. This reminds of Gwendolyn Galsworth’s book Visual Workplace Visual Thinking. One of the questions of the visual workplace is “What do I need to share?”. 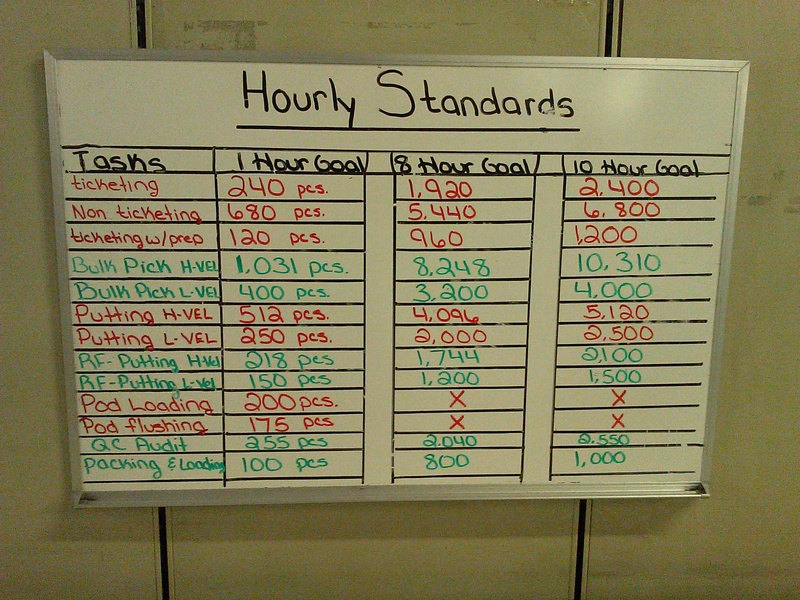 Goals and standards were something this supervisor needed to share with her team. The board is simple and effective. What have you made visual? What do you need to share? The A3 is a great communication tool. It can help tell a story succinctly and clearly making it easier for people to understand your thought process. An A3 will contain some background information, the current state, what the desired or future state is and an action plan to get there or measurements showing the success of the work. Putting together an A3 can take some time. It isn’t actually putting the A3 together as much as it is truly understanding the issue and stating it clearly and concisely. When your manager doesn’t understand the time it takes to truly understand how to put together an A3 it can be frustrating. As a lean learner, I encourage you to fight through that frustration and use the A3 to communicate with your manager or other managers. Show them the power of tell a good story on an A3. The A3 won’t be perfect, but this is OK. If the others you are sharing it with understand your thinking then they can better add input. This better input leads to quicker high agreement and quicker resolution. Think of using an A3 correctly as taking your time to do something right the first time, like setting up a machine. It may seem like it takes a long time but done right there isn’t as much rework because everyone understands quickly and you don’t have to have conversations over again because of the lack of understanding. Just like the machine being set up right the first time and not having to make tweaks over and over. In the long run, it is shorter to take your time upfront. Eventually, others will see the benefits and the effects will spread. As agents of change, relationships become an important part of the work. Without relationships it becomes very hard to influence others to change. It seems very intuitive when you say it, but sometimes it is forgotten. During a class that discusses the importance of having open and honest relationships, the graphic to the left was shown. At the start, it is your knowledge and skills about the subject (Skills/IQ) that creates the foundation of the relationship. If you prove to the person you know what you are doing, it creates a foundation of trust. As the relationship progresses over time, it becomes less about your knowledge. You have proven overtime the skills and knowledge to the other person. 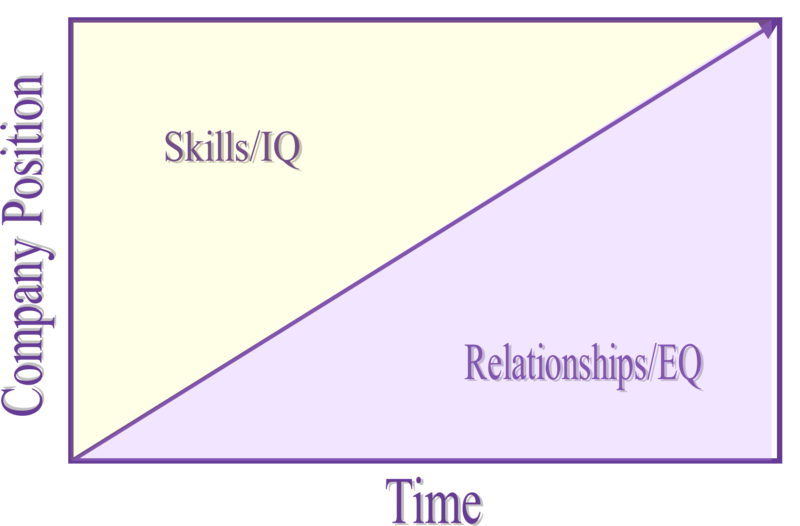 Now it becomes about understanding the other person and what makes them tick (Emotional Intelligence/EQ). Keeping the connection while still having open and honest conversations becomes the skill that helps create more and more influence as time moves forward. I heard this and took the time to reflect on my own relationships. I found this to be true. My skills have gotten my “foot in the door” with people and then once my knowledge was established then it become about how I could connect with the person on a one-on-one level. As you think about your relationships, do you find this to be true? What are your thoughts? In today’s tough economic climate, it is even more important the work we do is aligned with the company’s goals and priorities. As companies reduce headcount while still driving towards revenue growth, decisions have to be made about what are the top priorities for the company. If you cannot strongly link your work to one of the company’s priorities then you should really question yourself and/or your manager about the validity of finishing that work. Everyone in the company should know the priorities and should be asked to understand how their work is linked to achieving success on the priorities. One good way to do this, is through strategy deployment. This is process by which the priorities of the company are used to determine the priorities of the division and then those are tied to projects and/or initiatives for the current year. In a good strategy deployment process, catchball is used to get input from the layer of management below. This helps drive accountability and alignment throughout the organization. If you cannot link your work to one of the projects/initiatives that is part of the strategy then you have to ask if it needs to be done. Sometimes the answer may be ‘yes’. An example might be updating your servers or you won’t be able to run some of your IT systems. This may not be one of the priorities but it must be done in order to keep the business running. It is good to capture the linkages on an A3 document and use that as your guide throughout the year. It is amazing the power of alignment has on driving a company to achieving its top priorities. Are you aligned? As the year comes to an end, companies and organizations start to evaluate how they performed for the year and what they need to do to make next year better. The planning for the new year starts with objectives. What is it the company needs to do to be successful in the upcoming year? Reduce costs. Increase sales. Bring new products to market. Objectives are only half of the work though. Too often, I see companies set objectives above but never publish a goal for the objective. Can I reduce costs by $1 and be successful? $100 million? What? How much do I need to grow sales? What part of the company’s market needs to grow in sales? How many new products need to hit the market? How much revenue to new products need to generate? Without answers to these questions how are people suppose to know if they are being aggressive enough during the year? Maybe we only need to reduce costs by 5% or maybe it is 25%. The answer to this question will inform how you go about reducing costs, growing revenue or bring new product to market. As leaders, we need to set goals/targets for each objective. Then we need to give updates during the year to understand how we are progressing towards these objectives. These isn’t new or earth shattering. But it is something I see quite a few companies neglect. What are your objectives for next year? What is your goal for that objective?